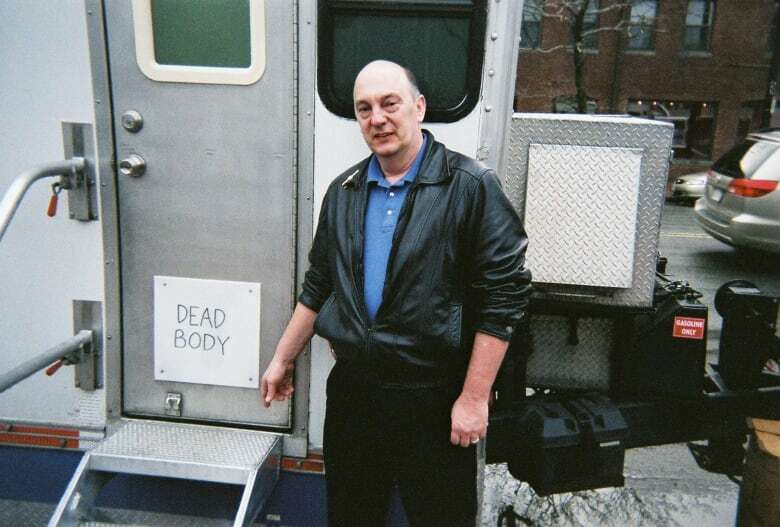 Chuck Lamb, who gained fame playing dead bodies on TV shows and films, is retiring after 12 years of acting. While most aspiring actors may dream of playing superheroes and landing dramatic speaking roles, Chuck Lamb saw opportunity elsewhere: playing a dead body. Lamb has become famous for playing dead people on screen. Throughout his acting career he's been strangled, ripped apart by a cursed turkey and killed by a ghost. But now after 12 years in the business, the 60-year-old has decided to say goodbye to playing dead. He blames a back injury for his retirement. "I've had four back surgeries now," said Lamb, in an interview with As It Happens guest host Rosemary Barton. "Some of the things that they ask me to do, I just can't do anymore. Even like flying out to L.A. really hurts." Lamb said he first started acting because it was always a dream to see his name in the credits of a TV show. Watching Law and Order with his wife was what specifically sparked his interest, he said. "When Jerry Orbach was one of the detectives on the very first Law and Orders, every single show in the first five minutes there would be a dead body and Jerry Orbach saying a smart remark above him," Lamb said. Lamb recalls one night when he had a dream that he was one of those dead bodies and Jerry Orbach was saying something about him. It was then that Lamb had an epiphany; if he could play a corpse, that would be the easiest way to get some screen time. "I said, 'You know what, as pale as I am, with bags under my eyes and bald ... I look dead walking anyway. That's just the way God made me,'" he said. "I put my hand on my hips like a superhero. I said, 'I could be Dead Body Guy.'" Lamb, who worked as a computer programmer, built a website and got his wife to help him take pictures lying around the house in funny poses as a dead person. Six weeks later, his story landed on the front page of The New York Times. He then started landing interviews on CNN, Good Morning America and The Today Show about what he was doing. In fact, it was the latter that helped Lamb land his very first role playing a dead man on the television show What I Like About You with Jennie Garth and Amanda Bynes. Since then, he's appeared in a number of shows and films, including ThanksKilling, Horrorween and Vacancy. He said seeing his name in the credits for the first time felt amazing. "I felt like a six-foot-tall, 230-pound bald Cinderella, if you can imagine that. I was on cloud nine." When it comes to playing a corpse, Lamb says being a convincing dead guy requires a lot of patience. "If people think that making TV shows and movies is easy, oh my gosh. I found out that it's so strenuous. Just the waiting part." He recalls his particular role in the movie Stiffs that tested his patience. In it, his character dies of a heart attack, gets put in a body bag and is carried down a flight of steps before he gets dropped on the floor. Lamb said that one scene alone took upwards of eight hours to shoot. "They shot that at least eight times and I had to go through makeup and wardrobe just for seven whole seconds of the movie." Despite the long shooting times and his back injury, Lamb said he's sad to retire from acting. He's currently selling the domain of his website. And in a letter posted on the homepage, he said he would love to see someone expand on what he started and become the next Dead Body Guy. But nevertheless, Lamb doesn't rule out the possibility of a comeback. "I'd love to do The Walking Dead. I'm a huge fan. And, I'd like to do Law and Order since that's what started all of it," he said. "As a matter of fact, I bug them all the time on Twitter and I think they just think I'm crazy because nobody has ever written me back." Written by Samantha Lui. Produced by Chloe Shantz-Hilkes.